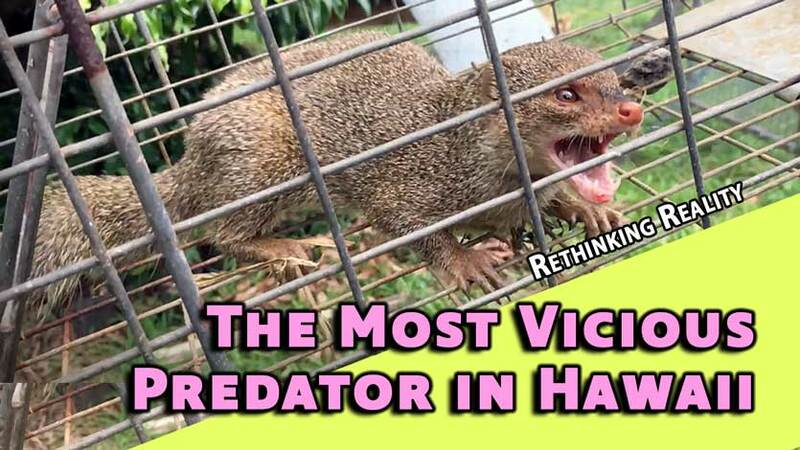 Rethinking Reality: The Most Vicious Predator in Hawaii – The Most Vicious, Destructive and Numerous “KILLERS” in Hawaii is The Non Native Savage Mongoose. The Big Question is “What should we do with these corrupt children killers?”. Mongooses are mainly carnivorous and blood drinking vicious killers. I have witnessed them personally brutally kill our baby lambs, piglets, baby birds in the trees, baby chickens, chameleons and lizards of any size. We set some live traps and caught these 4 Mongoose in a few hours; Wanting and trying to eat our chickens and their eggs. I have lived for 6 years in Hawaii and we have removed over 500 Mongoose from just around our animal and bird house areas. I am sure there are many millions of these destructive pest invaders just on the Big Island alone and they are destroying everything they can eat. If we do not constantly keep up with removing the Mongoose they destroy all of our birds and animals that they can. I call them a “pedophilia eating species of animals” because they prey primarily on helpless baby children of other sentient species. Many of the Cat species are very similar in eating children of other animals but they also eat the adults. Mongoose are mainly children eaters and cowards. This species of children killers have decimated thousands of species of birds and many other singular indigenous native species on the islands. 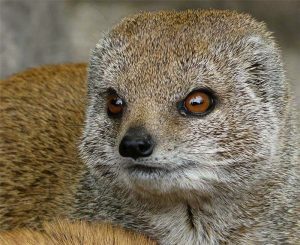 Mongoose really do not have any predators to eat them and keep them from over populating. In Hawaii the Mongoose is one of the most detested of these invaders. It has wreaked havoc on native birds on the Big Island, Maui, Oahu and Molokai for more than a century, and now it seems their numbers are multiplying rapidly. The Hawaii Invasive Species Council estimates that the mongoose, introduced in 1883 to control the rat population, has caused an estimated 50 million dollars in damage to Hawaii and Puerto Rico. 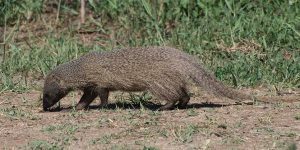 The mongoose did not impact the rodent population as hoped because it is most active during the day while rats are primarily nocturnal. Like so many invasive species that now run amuck on islands around the world, mongooses were intentionally introduced to Hawaii. Sugar cane farmers took their cue from Jamaican plantation owners who imported mongooses to control rat populations. In 1883 the mongooses were let loose in the fields, an approach that proved to be colossally uninformed. As it turns out, rats are nocturnal and mongooses are diurnal. The exotic predators never came in contact with their rodent prey, and native bird populations began crashing instead. The experiment didn’t exactly work. Mongooses consider rats an okay thing to eat – the way you might think walnuts or rutabagas are okay to eat. 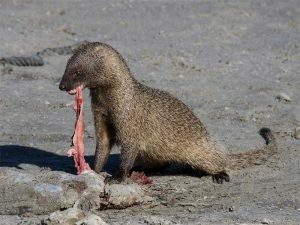 But mongooses also like lizards, crabs, toads, frogs, birds and bird eggs, fish, spiders, and the grubs of all kinds of beetles and caterpillars … and just about anything else they can get their savage little mouths around. insects, spiders, snails and fruits. They’ve also been known to catch mammals many times their size, and even the young of deer. They also eat snakes, but snakes aren’t a problem in Hawaii. We all know this simple fact of life: “Everything that is alive wants to stay alive”… that is is the law of nature. Let’s think about this: To let one non native, destructive Mongoose species live to kill/eradicate many of the very rare Hawaiian native species is a choice we will all have to make in Hawaii. Personally, they should be either relocated or simply eradicated to ensure the exotic native birds, reptiles and other Hawaii only species can repopulate and not go extinct. Recommended Courses: Rethinking Reality: Do I Kill The Lamb of God on Easter Sunday?, Taking The Right Baby Steps To Regain Health And Wellness and Releasing Deep Seated Toxicity.